In stock -This product will ship today if ordered within the next 45 minutes. Chlorella provides a wide array of vitamins, minerals and amino acids, as well as being the highest-known source of chlorophyll. While these are all beneficial, the greatest value of chlorella lies in a fascinating ingredient called Chlorella Growth Factor (CGF). 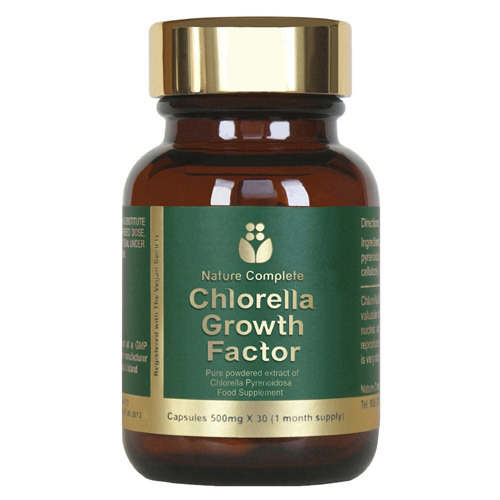 CGF is a nucleotide-peptide complex derived from a warm water extract of chlorella. It is made mostly of nucleic acid derivatives. Each cell multiplies into four new cells about every 20 hours, and CGF promotes this rapid rate of reproduction. Nucleic acids in digestion and assimilation are broken down and combined with other nutrients such as vitamin B-12, peptides and polysaccharides. That means that the DNA and RNA we eat do not directly replace human cellular DNA and RNA, but their amino acid combinations after digestion and assimilation immediately provide the "building blocks" for repair of our genetic material. When our RNA and DNA are in good repair and able to function most efficiently, our bodies are able to use nutrients more effectively, get rid of toxins and support optimum health and wellbeing. Cells are able to repair themselves and the energy level and vitality of the whole body is raised. Nature Complete Chlorella is suitable for everyone, including children, pregnant and nursing mothers. Suitable for vegans, it is non-GM and free from gluten and additives. Below are reviews of Nature Complete Chlorella Growth Factor - 30 Capsules by bodykind customers. If you have tried this product we'd love to hear what you think so please leave a review. Nature Complete Chlorella Growth Factor. It is the UKs first pure powdered extract of chlorella pyrenoidosa product that contains a certified organic ingredient. Suitable for vegans, it is non-GM and free from gluten and additives.